Our precision finished and premium quality Damascus Blades are known for their non-breaking ability, ultimate cutting edge and most of all the Bird's Eye pattern which looks great. Each piece of art is unique in itself, as no two blades are the same. They may give you a tough time to pick and choose from the extensive range of designs on offer, but are definitely an owner's pride. For producing Damascus Blades, alternating bars of steel carbon and iron, having different degrees of hardness, are being used. This composite of alternating bars of high- and low-carbon steels is then forge welded together. The process is repeated until the desired pattern is obtained. Also, the mix of approximately 500 layers does not allow the crack to propagate. 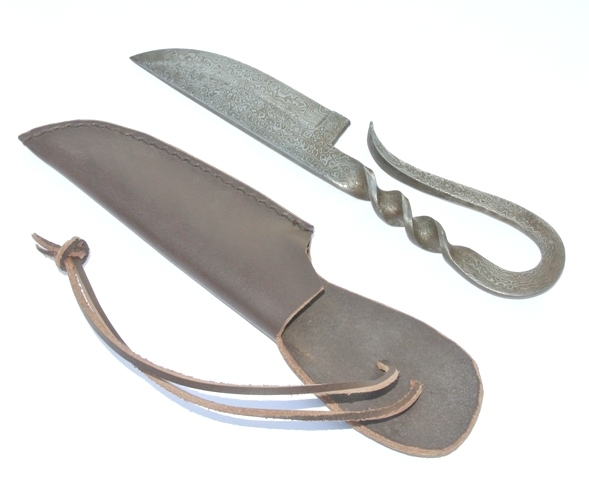 The matrix design on the blade depends on how the black smith heat-treated the blade. This way a variety of convoluted patterns can be created. The Rockwell Hardness of our Blades may vary from 44-48. Damascus paper cutter with horn handle and silver inlay work. 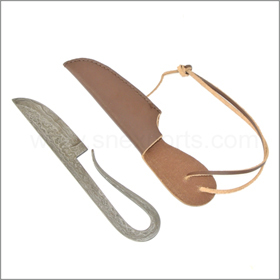 Overall length 8 inches (20.5 cms). 4-5 inches mini size paper cutters are also available. This is a beautiful Damascus dagger. 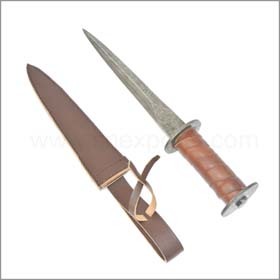 Rondell means round or circular; the dagger gets its name from its round hand guard and round pommel. Here the blade is completely damascus, the grip is covered with leather and the hand guard & the pommel are both in damascus. Overall 11.6 inches (30 cms) long. 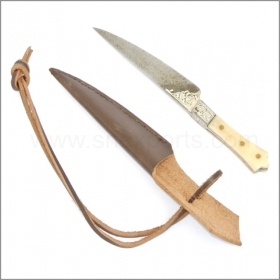 Damascus knife with a beautifully rounded wooden handle. The handle also has a Damascus steel disc at the bottom. The blade is adorned with hand finished silver inlay work. Overall 12.4 inches ( 32 cms) long. Blade 7.1 inches (18.5 cms) long. Crown knife with a Damascus blade and a horn handle adorned with brass rivets. The blade has beautiful silver inlay work done. 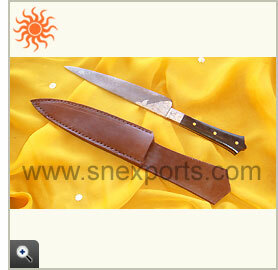 Overall length 9.7 inches (25 cms). The price of scabbard will be extra. Crown knife with a Damascus blade and a bone handle adorned with brass rivets. The blade has beautiful silver inlay work done. Overall length 6 inches (15 cms). Beautifully curved Damascus knife inspired from medieval ages. Knife: overall 8 inches (20 cm) long. Beautifully curved Damascus knife inspired from medieval ages. The handle also has skillfully forged curles on it. Knife: overall 8 inches (20 cm) long. 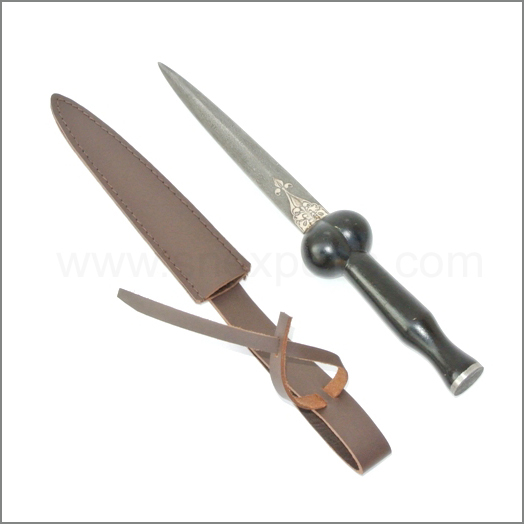 This is a set including a slander knife and a pricker with bone handles. Knife: overall 7.1 inches (18 cm) long. Blade 4 inches (10 cms) long. Pricker : overall 6.3 inches (16 cm) long. Blade 3.4 inches ( 8.5 cms) long. 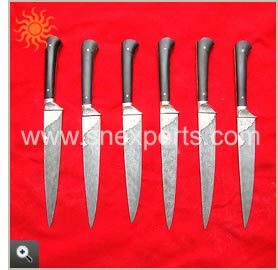 This is a set including a slander knife and a pricker with horn handles. 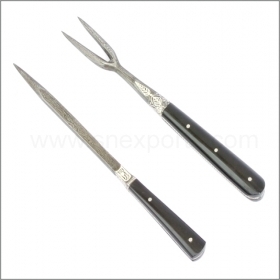 Damascus steel pricker & fork with a polished horn handle. They come with very fine silver inlay work. Fork: overall 7.5 inches (19.5 cms) long. Blade 4 inches ( 10 cms) long. Pricker: overall 7.5 inches (19.5 cms) long. Blade 4.7 inches ( 12.5 cms) long.